This film is based on a true story that happened in the 70s. 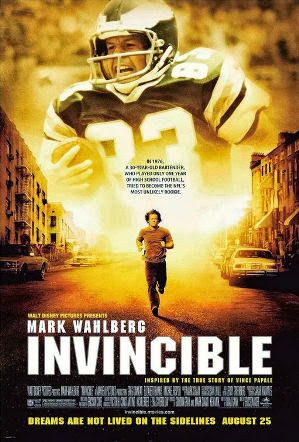 The 30-year-old substitute teacher Vince Papale (Mark Wahlberg) has just lost his job, and to make matters worse, his wife has also left him. Just at this time, the professional team of the Philadelphia Eagles breaks new ground. In a kind of casting anyone can imagine with the Eagles, and give to the best of his ability. Papale is encouraged by friends to participate in the training and actually manages the only one made it into the first team. Here the battle really begins, because his teammates despise the newcomer from the working class and make his life as difficult as possible. The film is a classic underdog story of a simple man who remains steadfast against all odds, to be finally recognized. The role is Mark Wahlberg cut to a tee. Wahlberg’s family lived at the poverty level, as a teenager, he often came into conflict with the law and was a member of a street gang. I see this actor in this film very much and he convinces all along the line. The viewer is immediately on the side of the underdog. In addition, make great football scenes, 70s rock feel and film music makes this film special. It is not going well for the aging legendary coach (Al Pacino) of the Miami Sharks. After a botched start of the season, he also has to his injured star quarterback (Dennis Quaid) replace. Imitation Willie Beaming (Jamie Foxx) has talent, but reveals characteristic weaknesses that are counterproductive in American football. In addition, the power-hungry daughter (Cameron Diaz), the team owner wants to get rid of the coach sooner rather than later. A beautiful story about a football coach who has to realize that American football has turned into a gigantic market. This is controlled by greedy people for whom the sport has no more meaning. In addition to the liquid-told story, the film is critical of the negative aspects of the performance principle in pro football. Al Pacino as always plays at a high level. Jamie Foxx started his Hollywood career with this film. In supporting roles rapper LL Cool J and Terrell Owens are among others to see. The NFL denied the filmmakers unfortunately, the use of original team name, probably due to the above criticism. Oliver Stone has directed, among other things this was also responsible for the films Natural Born Killers and U-Turn. “Program – The Program” is a look behind the scenes of a fictional college football team. Coach Sam Winters (James Caan) is trying to unite the characters of his difficult team to a team. Above all, his quarterback Joe Kane (Craig Sheffer) is at the center, which does not seem to come right with the huge pressure of expectation. Another player to watch is Darnell Jefferson (Omar Epps). Jefferson comes from a poor background and looks in American football, the only chance to get somewhere. The film shows in a realistic way the problems with which the College Football League NCAA has to deal in reality. Of alcohol abuse, about players who are rarely or never look in the classroom, to doping and illegal allocations of agents. These topics are packed into an interesting story. Halle Berry is seen in a supporting role. Interesting! 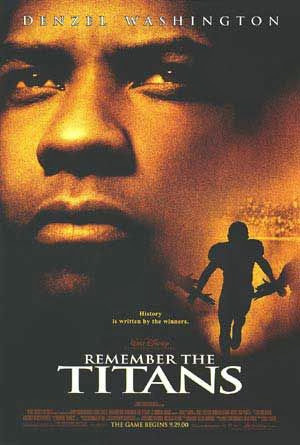 Also, this movie was a true story of football as a template. In the wake of the abolition of racial segregation are early 70s after two races merged separate high schools. Also, the football teams of the schools logically be transferred to a team. The African-American coach Herman Boone (Denzel Washington) gets assigned the management of the new team. His white assistant coach Bill Yoast (Will Patton) feels left out. Also, the players are not green, but a joint training camp and unorthodox methods weld together the various characters. Back at home, players find in a racist and hostile environment again that it presents some challenges. Sure, the film is not a profound study of the social conditions of that time, but he tells an exciting story that is even funny in places. The casting of roles is also well done, especially Will Patton makes a very good figure. The classic with Burt Reynolds – his character by the way was himself a former college football player at Florida State University. The film is about Paul Crewe (Burt Reynolds just) a draw ex-football player who beats his wife, drunk driving car, policemen insulted and attacked them also. Crewe overstepped the mark and is sentenced to a prison sentence. In jail, the prominent newcomer of the prison is forced to build a football team, and this lead into a game against a troop of guards. The inmates are anything but receptive to this plan and Crewe must make an effort to shape from a pile of felons to a functional team. Conclusion: The film has it all: an interesting (but unusual) story, brilliant cast, colourful characters, funny moments and lots of football action. It was definitely better than the remake with Adam Sandler in 2005. Blindside – The Big Chance tells the life story of professional football player Michael Oher (superbly played by Quinton Aaron). Oher is since 2009 the professional team of the Baltimore Ravens as a Left Guard operates. At the beginning of the film we see the life circumstances with which Oher had to fight. He comes from a very poor and predominantly lives on the road. Due to his hulking stature, the reserved and taciturn Oher is known to all as “Big Mike”. By chance, and the interest of the football coach at the sporting qualities of “Big Mike” Michael is taken at a Christian private school. Leigh Anne Tuohy (Sandra Bullock), the wealthy mother of a classmate, initially feels sorry for Oher. She takes him on at home. The film is boring at any time. American football scenes are very well staged. Besides all the drama, the film has to offer funny scenes. Especially the interaction of Sandra Bullock and Tim McGraw, who embodies her husband repeatedly causes loosening. For Bullock was more than worth it – you get 2010 the Academy Award for Best Actress for this role. You guys can check the IMDB rating of other football related movies too.